We will be happy to respond to your needs as concerns dates and other resort options via return e-mail. Please use the "Send email" for any questions that you may have. This is a Timeshare facility. Owners list/de-list weeks continuously; hence, the only valid method of establishing availability and price, is by contacting us via e-mail. Please ignore the Calendar availability feature. Owner of 50 weeks at this resort - unlike other listings by commercial brokers on VRBO! Work with an actual owner who cares deeply about this resort. We specialize in the Marriott Maui Ocean Club! 7 day rentals with check-in on Fri, Sat or Sun only. Additional days must be arranged through Marriott central reservations. The Marriott Maui Ocean Club is a full service destination Time Share resort on Kaanapali Beach. Includes all amenities listed including weekly maid service, room service, valet parking, and all services that you would expect in a five star resort. Facility is periodically renovated and refurbished as a part of the ongoing commitment to excellence. Most recent major renovation completed in Fall of 2017. Directly on the beach with full beach services, restaurants, and bar. Near Lahaina and 10 minute walk to Whalers Village restaurants and shops. The original Kaanapali Beach area and the best spot in Maui. Closest resort to the ocean. You will save over 60% compared to hotels nearby! The Marriott is only 3 miles from Lahaina, the charming 19th century historic whaling village which is now a mecca for shops, restaurants and entertainment. Lahaina is the most interesting and quaint town in the islands. Whalers Village, the Kaanapali shopping and restaurant area, is a short 10 minute walk up the Beach Walk. There are several beachside places to eat; a general store, and a number of shops (including high end retailers). Whale watching in the late Fall and Winter, parasailing off the beach, scuba and surfing lessons nearby, jet ski, outrigger canoes, snorkeling within walking distance (Black Rock), poolside service, relax in the sun or shade. Ferry from Lahaina to Lanai (resorts and more golf). Kaanapali golf (2 courses) across the street. A great deal to do to suit all desires; superior to isolated resorts because of entertainment diversity. Marriott is at the closest point to the ocean, as close as 50 - 70 feet. Views are unobstructed and panoramic, and include the nearby islands, sunsets and beach. The "Sponsored Links" below are inserted by VRBO and are not condoned nor recommended by the owner. Evan Price Binnacle Realty, Inc. We have been coming to Maui for over 25 years, and feel blessed that we are able to do so again this year. We feel as if we have enjoyed most of the pleasures of the island and are happy to share our experience with anyone who is interested. We have also visited all of the other islands and resorts and find the Maui Ocean Club superior to all based on the quality of the resort and the proximity to dozens of things to do to entertain the entire family. With over 12 years of experience renting to our satisfied customers (100+), we have built a reputation of always delivering on our commitments. Kaanapali Beach is the most sought after beach on Maui, and possibly in the world. Hawaii has been rated the number one resort destination for many years, and the Marriott property has always been certainly equal to the best on Kaanapali. Located less that 3 miles from the charming whaling village of Lahaina, with it's shops, theaters, harbor and restaurants, the Marriott is perfectly located on the Kaanapali beach walk, which also connects to Whalers Village, less than a mile down the beach with more shops and restaurants. The Marriott Maui Ocean Club has improved consistently over the last 13 years; hence, it now ranks first along Kaanapali beach! The Marriott is uniquely equipped for families with lagoon pools(3), Pirate ship pool, beach activities, whale watching (Nov - Apr), para-sailing, sailing, snorkeling, surfing, excursions, volcano exploring, golf and many other activities. With the addition of the two new purpose built towers (Napili and the Lahaina towers), two additional lagoon pools have been added with associated lounge areas, pool bars, hot tubs and beautiful lawn areas. Closest resort to the beach in Maui. 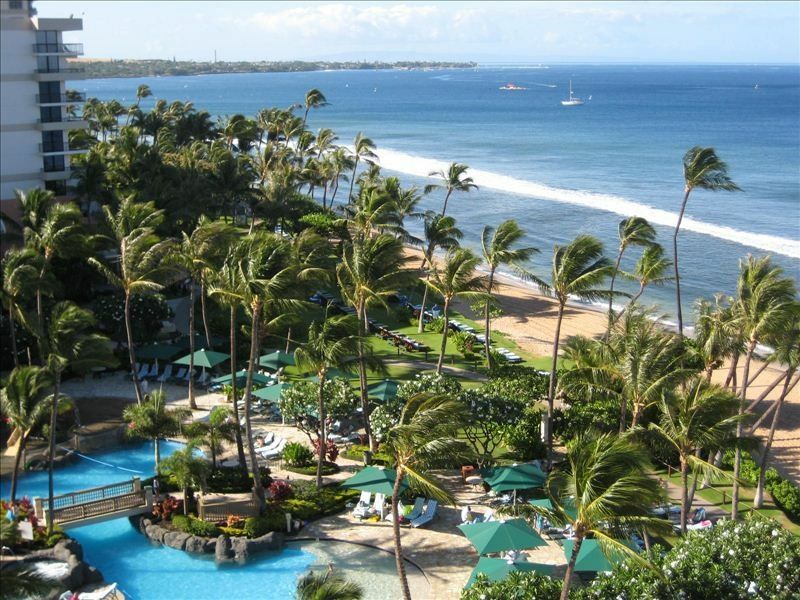 Marriott is directly on the beach and is bounded by the Kaanapali golf course. In each room and common areas. No charge for this service. Full size in Villas with full kitchen. Additional under counter refrig in lock off section. Full kitchen in Villas - Lahaina and Napili Kitchenettes in Suites - microwave, coffee, toaster, various utensils. Use elec frypan for light frying. Over 60 channels of cable programming. (4) Lagoon pool with multiple waterfalls, water slide and water sports. Pirate ship pool for toddlers. Napili and Lahaina Villas also have lagoon pools; a bit more sedate. Lagoon pool, waterslide, children's pirate ship pool, hot tubs (4), pool bar, beachfront, water sports/activities, Broadband Internet (WI-FI & kiosk), Cooking Utensils, private lanai's, gas grills, golf (2 courses) across the street, On property restaurants (2), shops, activities and full concierge services. No hassles. Evan took care of all the details. Trust him. We will deal with him again, when needing a condo to rent. This is a beautiful location. The room was beautifully decorated and very comfortably appointed with everything I needed for my trip (great bed, couch, desk, refrigerator, coffee pot, basic kitchen utensils etc.). The entire facility was immaculate and very well maintained. My room was ocean front with private patio, so I was able to start and end my day with a gorgeous, relaxing view of the ocean. The grounds were incredible and the amenities provided were great. The Marriott is located within easy walking distance of great shopping and dining and a short drive from Lahaina. I would highly recommend this location and this suite. We had 8 people in the 2 bedroom place. Worked very well considering 4 of the group were 10 and under. First time to Maui. Trip started off bad because of a 3 hour wait to pick up the rental car from Budget. Avis had a 5 hour wait. The trip from OGG airport to the Marriott was an easy drive. The Marriott and villa was as advertised online. Gorgeous condo with wonderful oceanfront views from the villa. We saw whales everyday and my sons and I snorkeled about every day right in front of the Marriott. We saw literally hundreds of tropical fish and swam with a few sea turtles. The entire staff was great. I'd book with Evan and stay again in a heartbeat. Of note, we stayed an 8th night in a smaller hotel style unit to extend our stay. I would not try to save money and do that again as we were very cramped. Evan's 2 bedroom villa is awesome. Can't wait to go back! Not an over exaggeration, we've been a lot of places and we really had the "Best Family Vacation EVER". The property is perfectly located and has the best wide beach. Some resorts had thin small beaches. It is perfectly located near Whaler's Village and quick distance to Front Street shops and restaurants. The resort is vast and hard to find nothing to do. The 3 pools have something for everyone, young and old. The villa was clean and spacious and had all the amenities. Something I wish I knew beforehand was that located near near the lobby is a community kitchen for all to use. This was helpful since the villas were only equipped with kitchenettes. I thought the Molokai tower was ideal due to it's proximity to the communal kitchen, laundry facility and onsite Starbucks. The parking is near Lanai Tower and Lahaina Villas, but that wasn't an issue. We used the main entrance circle drive for drop offs and loading/unloading. My husband had a cabana beach massage from the onsite Spa by the Sea which was great! We walked up and down the Beachwalk many times that week to visit other resorts and restaurants. We even walked to our meeting point for our whale watching excursion. People are into the beach lounger reserve game (6a.m. towel reserve) but only along the main pool. Even during busy Spring Break you were able to find a lounger either on the lawn or in the 2nd/3rd rows around the main pool. Don’t hesitate to book here. Also, we felt no pressure to buy a timeshare. Mahalo! Please note the rate quoted is a base rate. Rate may vary depending upon week of availability and view category of the unit. Rates are not valid without an e-mail quote from the owner directly. This is a timeshare facility with units offered by many individual owners at rates that they establish. Availability is very dynamic as owners make units available or rent them continually. Hence, the need for a quote for your specific inquiry. Unlike booking agencies, as owners in this facility, our guests pay only a daily resort tax (approx $14 - $24/day) collected by the Marriott. You will not pay for parking or any other taxes or fees.